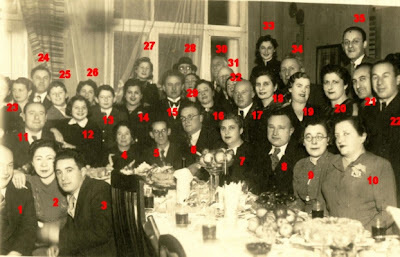 The photo shows the celebration of Miron (Meir) Meller's (No 13 above) Bar Mitzvah in November 1939 at the home of Yudel Meller (No 11 above, co-owner of a factory and his father. Yudel Meller was the co-owner with his brothers Shmuel, Mordechai, and Khona of a business which encompassed a printery, a paperboard factory and a saccharin tablet factory. In addition, the family was involved in the Meller Candy factory in Rokiškis). No 5 above is Zerach (Zorach) Orelowitz, my grandmother's (Riva-Rachel Orelowitz) 1st cousin (please see my Memorial Page and my Family Tree). Zerach was a moneylender and owner of a newspaper kiosk in Rokiškis. Most of the people in the photo were either exiled to Siberia during the Soviet rule (please see my post "Lithuania under Soviet rule, 1940-1941") or murdered in Rokiškis in August 1941 in the aftermath of Nazi Germany's invasion of the Soviet Union. (Also, Jewish refugees from Poland presumably took part in the Meller family celebration). 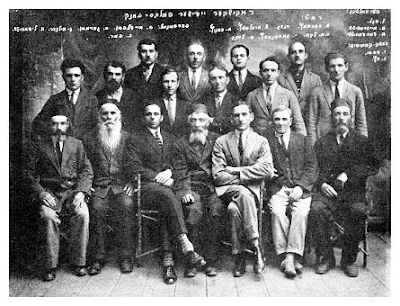 If I am not mistaken, Zerach's father Shlomo (Shloime) Orelowitz served as staff member of the Yiddish Volksbank (Jewish People's Bank)1 in Rokiškis---please see picture below, Shlomo sitting first right (photo dated 1929?). Shlomo Orelowitz (Šlioma Orelovičius) also served as a member of the City Council (miesto taryba) of Rokiškis. In 1934 the municipal council consisted of 12 members, 5 of them Jews (other Jewish members were: Abraomas – Vulfa Volpertas, Abraomas Charmacas, Mejeras Berkovičius and Chaimas Lekuchas). Actually, Zerach Orelowitz, since the postwar period until his death, had always been very close to my Rachowitz family. In the early 1970s, Zerach together with us made "aliya" to Israel. My Dad, Aaron-Israel Rachowitz, took care of all his needs and was very sensitive to all his needs (Zerach had no close family). Zerach son of Shlomo, died of natural causes at age 94 on April 9, 1987, may He rest in peace. In pre-war Lithuania, many members of the Jewish middle class, especially the educated strata who had already experienced the establishing of Jewish autonomy to some extent, mobilized their resources in order to strengthen the social economic basis of the Jewish masses and their livelihood. With the blessing and initiation of the Economics Committee at the Ministry for Jewish Affairs and with the assistance of the “Foundation,” a national financial system of co-operative credit societies was established. By the end of 1920, these were already active in 44 cities and towns and were named “People's Bank”. In addition to making positive impact on local economic activity (extending loans, etc), they were also of importance in the social and cultural sphere. In a number of places, the community bodies and other organizations also used the bank building. There were also cases of the bank granting study scholarships and prizes for cultural activities. 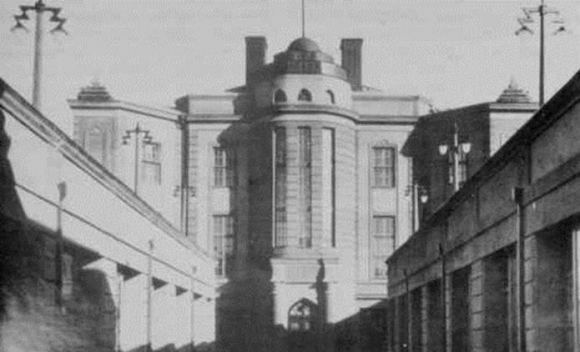 In order to co-ordinate and regulate the activities of the People's Banks in time of need and crises, a central institution was established in 1921, [in Kaunas -- D.R. ], formally called the “Central Jewish Bank for the Encouragement of Co-operation.”[---please see picture below] 71 People's Banks throughout the country were linked to it, and the number of (dues paying) members reached 11,000. Over the years, the capital assets of the institutions increased, as did the amount of deposits and savings. Thanks to that, the conditions for granting loans to members and public institutions were loosened. In 1930, 85 People's Banks existed in Lithuania with 22,262 members. In that year, 11,953 loans were granted to them and to others in a total amount of 10,249,159 Lit (approximately one million Dollars). Although the People's Bank was open to non-Jews as well, the share of gentiles was no more than 5%. Work in the offices, correspondence and daily routine was conducted in Yiddish, and this was also true of the national conventions and conferences which took place every few years. This was, therefore, a Jewish banking system spread throughout the cities and towns of Lithuania. At the time, the total deposits amounted to 14,113,413 Lit (approximately $1.4 million), of which 46% came from members, 16% from institutions and [the rest] from non-members. Taking into consideration members' families and all others who required the People's Banks' services, and that of its associates, we can conclude that they served about two thirds of the Jewish population. Unlike similar Lithuanian banks, that enjoyed cheap governmental credit, the People's Banks had to depend on deposits only. In 1933, a special bank was established to assist Jewish farmers (Yiddisher Landwirten Bank)---please see en.15min.lt - news portal: "Lithuanian bank architecture: Symbols of wealth, power, and crisis." Central Jewish Bank (Centrinis žydų bankas) building, Kaunas, Laisvės al. 106. The bank was built by the architects-engineers G. Mazelis and M. Grodzenskis.